Woot has some previous generation Kindles and Fire tablets on sale again. Like usual they’re labeled as refurbished, not new. They’ve got the Kindle Paperwhite 2 available for $49, but it’s almost gone already so it probably won’t last much longer. They’ve also got the 3G Kindle Paperwhite 2 for $65. That’s a really low price for a 3G Kindle but keep in mind that 3G wireless is only available for the Kindle store and the built-in features like Wikipedia and translations, not web browsing. The main difference between the Paperwhite 2 and the current Paperwhite 3 is the screen resolution, 212 ppi vs 300 ppi. The storage space is also half at 2GB instead of 4GB, and so is the RAM, which only comes into play with the screen reading feature. The overall software features and the physical dimensions are the same. Woot has some deals on Fire tablets as well. The Fire HD 6 is available for $25 for 8GB and $30 for 16GB. 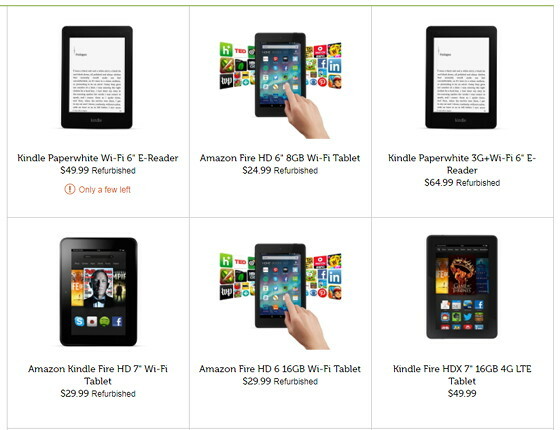 The 7-inch Kindle Fire HDX with 4G LTE is $49, but it’s used, not refurbished like the others. The HD6 is a solid (ie, a little thick) easy to hold tablet (because of it’s width). $25 is an almost insane price.